Sync tasks from the iPhone to Microsoft Outlook using Appigo Sync Beta for Windows and Appigo Todo for the iPhone and iPod touch. Appigo, Inc. today released its beta version of Appigo Sync™ for Windows as a free download from their website. Appigo Sync allows users of Appigo Todo™, the company's to-do list app for the iPhone and iPod touch, to synchronize tasks directly with Microsoft Outlook using a Wi-Fi network connection. Appigo™ is providing the public beta to enable a larger set of its customers to use the technology and to gather important feedback. The official public release of Appigo Sync for Windows will be released after sufficient customer feedback is gathered. The free app can be downloaded at: http://www.appigo.com/appigo-sync . "This is an exciting advancement for our customers using Microsoft Outlook, who will now have a way to synchronize their tasks directly from Todo on their iPhone," said Calvin Gaisford, President and Co-Founder of Appigo, Inc. Connecting Todo™ with Appigo Sync for Windows is straightforward. With an iPhone or iPod touch on the same network as the Windows computer, users follow a simple pairing process which enables synchronization between their device and their desktop. Users can then add, remove, or edit tasks either on their Windows desktop or their iPhone and synchronize any changes between the two. Appigo has historically focused on keeping users of Todo connected. Earlier this year, the company released a version of Appigo Sync which provides Wi-Fi synchronization between Appigo Todo on the iPhone and iCal on Mac OS X. Originally, when the iTunes App Store opened for business on July, 11, 2008, Appigo Todo released with synchronization with two popular online task management services, Toodledo and Remember The Milk. Appigo Todo gives users flexibility in organizing any form of to-do list. 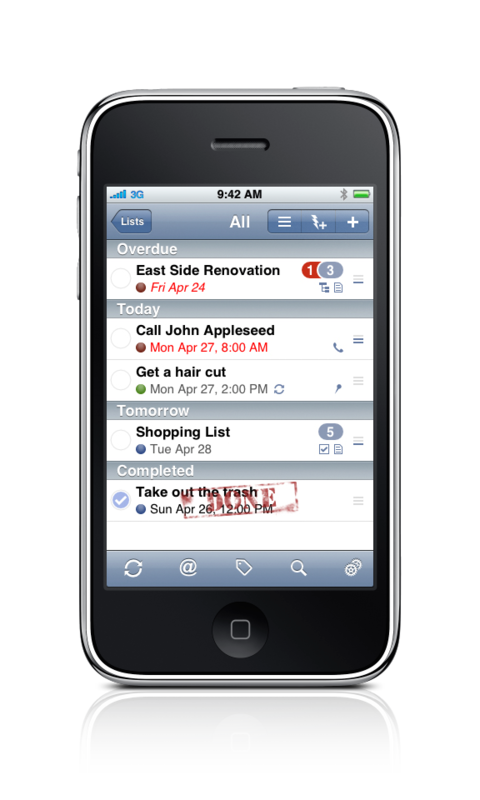 With projects, checklists, and task alerts, Appigo Todo is designed as a fully functional task management app for the iPhone. With support for iCal on Mac OS X and now Microsoft Outlook on Windows, Appigo Todo now has a solid synchronization story for both desktop operating systems. Todo Lite™, Appigo's free version of Todo, can also connect with Appigo Sync for Windows. Todo Lite offers customers the ability to create up to ten standard tasks and also five subtasks per project/checklist. Appigo Todo requires iPhone/iPod touch 3.0 or later. Appigo Sync for Windows requires Microsoft Outlook 2003 or Microsoft Outlook 2007. Appigo Sync for Mac requires Mac OS X 10.4 (Tiger) or newer. Appigo Todo ($9.99), can be purchased directly on the iTunes App Store. Todo Lite is available as a free download on the iTunes App Store. Appigo Sync for Mac/Windows is available as a free download from Appigo's website. Appigo, Inc., develops high quality applications for the exciting iPhone computing platform including Todo (powerful task management), Notebook (notes available everywhere), and AccuFuel (fuel efficiency tracker). With many years of experience in mobile computing, networking and user interface design, the Appigo team focuses on adding polish to its applications for a more enjoyable end-user experience. The products created by Appigo have quickly gained favorable reviews worldwide. For additional information about Appigo and their products, including full demonstration videos, please visit their website. Appigo, Appigo Sync, Appigo Todo, Appigo Notebook, Appigo AccuFuel, the respective app icons, and the Appigo Todo logo are trademarks of Appigo, Inc. Copyright 2008-2009, Appigo, Inc. All rights reserved. Other company and product names may be trademarks of their respective owners. Appigo Todo uses the Remember the Milk API but is not endorsed or certified by Remember The Milk. Appigo Todo uses the Toodledo API but is not otherwise affiliated with Toodledo.